Auckland is New Zealand's largest city and is situated on a narrow isthmus with 2 large harbours on either side. On the western side is the Manukau Harbour, and the eastern side is the Waitemata. It is this harbour that Auckland's CBD is located on. At the harbours entrance is the Hauraki Gulf, a body of water that has many islands, bays and beaches that feed Auckland residents appetite for the water. Auckland provides some great motorcycle riding options, Heading west will take you to the wild and rugged coastline that has popular surf beaches like Piha, Bethells Beach and Muriwai. To get to these you ride over the Waitakere Ranges which are hills clad in indigenous forest and provide some great roads to ride with some spectacular views over Auckland city. Heading north from Auckland can take you over the Auckland Harbour Bridge on Auckland's main motorway. This doesn't provide the best motorcycling but heading north-west will involve a short motorway journey and then onto some more motorcycle friendly and less traveled roads taking you north and following the large Kaipara Harbour. South west leads you on an easy days ride to the surfing and fishing town of Raglan which has a wonderful laid back atmosphere. This provides a great place to stop and reflect on the fantastic roads that have brought you there. Riding south-east brings you to Auckland Motorbike Hire's "neighbourhood" of Maraetai and the Pohutukawa Coast. Luckily for us, this is some of the best motorbike riding roads in Auckland and arguably New Zealand. Riding south-east past Maraetai is also the scenic and popular local motorcycling route that will take you to the Coromandel Peninsula. To see more of Auckland, contact us and find out how easy it is for you to get on one of our quality, modern motorcycles and ride these roads. 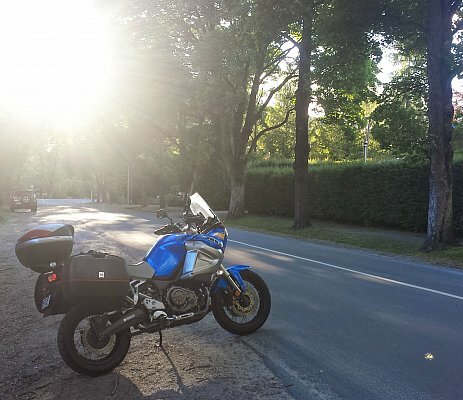 AucklandMotorbikeHire.com specialise in self guided day tours that will provide you with all you need to ride around Auckland and its surrounding regions including quality riding apparel and GPS units with great routes loaded and ready to go. If you have a bit more time up your sleeve, we have 2 and 3 day options to allow you to see further afield. Had a real long flight back, but the new NZ airport is really nice, much better than 5 years ago. We had a great trip, fun riding, should have stayed a week longer. Hope to be back in late NOV for the Burt Monroe Festival (a long ride!) or maybe in FEB. for the Pukekohe Classic races and the Paeora Street races....we'll see.